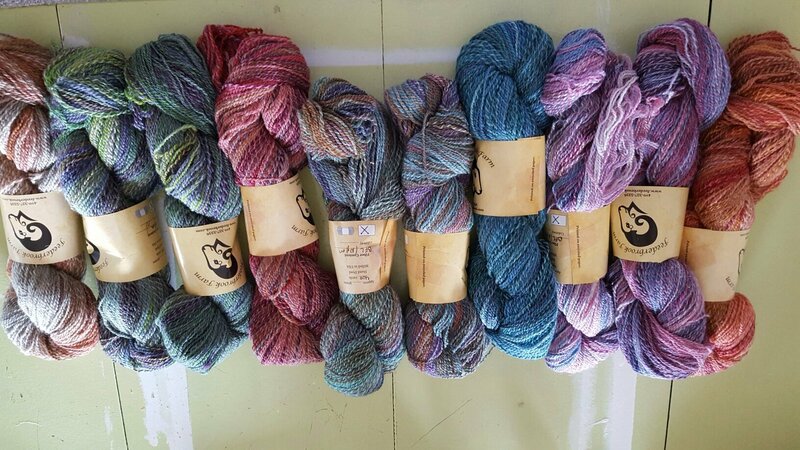 Hot on the heels of twizzlefoot from Mountain Colors is the next shipment of color. Feederbrook farm managed to take a combination of bfl and nylon and dye and spin it into awesome lusciousness. I have been sitting on this post trying to figure out the fairest way to distribute colors. I’m going to pick a name, reach my hands on the box and pull out a skein and that’s what you get…..If you want to trade, you can do so here in the comments or come to the meet up Friday, July 15, 2-5 or 6-9 or Saturday from 10-4. Upcoming projects: Fisher Lassie from superwash dk by Stonehedge, Beld in silky wool, and a winter luxury yarn club.